Here is how to update Galaxy Tab A 7.0 2016 to Android 7.1.2. 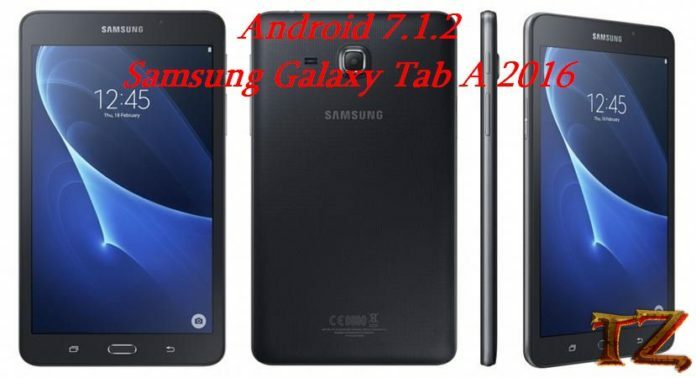 Dear all Galaxy Tab A 2016 users! Samsung might seem to stop updating a newer Android version for your Galaxy Tab, which is a pity. You want to update your tablet to a newer version, but after spending hours on Google, you cannot find a cook ROM for your device. So, this post today is written to help you install the Android 7.1.2 Nougat on your device. If you like to experience the Android 7.1.2 Nougat on your Galaxy Tab A 2016 (T285), then keep reading this post to update the version. This ROM currently works with LTE SM-T285 model, if you flash it on SM-T280 model, your device might hang the logo. Now, on your tablet, go to Settings > About Phone > Software Version and tap on Build Number 7 times to activate Developer Option. Once done, return to Settings, tap on it and enable OEM Unlock and USB Debugging. Next, power your device off and boot it into Download mode by pressing Power + Vol Down + Home When you see the blue warning screen, simply tap on Vol Up button. Once done, unplug the cable and press Power + Volume keys combination to reboot your tablet.